Through our efforts at being a more diverse academic community, we are contributing to western Pennsylvania in a way that will help to secure its transformation and success. 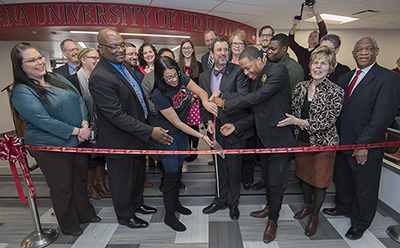 Did you hear that we opened our new Multicultural Student Leadership and Engagement Center? Our student leaders are thrilled to have a new space dedicated to their extracurricular activities. Our new and improved Elkin Hall provides the place and space where students can be individuals and confer with others of like interests, and it’s a place where they can collaborate and work together with people who are completely different. The center is abuzz from early morning to late at night, as various councils and groups and subcommittees meet to govern, plan fundraisers, and learn from doing. I couldn’t be more pleased. In our much more globalized world, creating this center and the opportunities it presents is at its most simple definition a practical approach to providing our students with a dose of reality. We owe them the opportunity to develop an appreciation for what commonalities and differences between people might mean in the workplace and in our communities. We owe it to them, so that they will know how to build better teams, to navigate circumstances that are new and different to them, and to find solutions to problems that plague us all. Recently, I had the pleasure of attending the first in a series of meetings with alumni in Pittsburgh. As you might imagine, speaking with alumni in Pittsburgh includes telling them why IUP is important to Pittsburgh. It’s an easy tale to tell with an abundance of research and service occurring. With our status as one of only four public doctoral/research universities in Pennsylvania—Pitt, Penn State, and Temple are the others—we are interested in forging more corporate partnerships. My presentation was full of examples—from how our Regional Planning faculty and students are assisting communities to prepare for the construction of the Shell Cracker plant in Beaver County to how an array of our academic departments are making life better for people with autism. Yet, out of those examples, I think the most important point I made was how, through our efforts at being a more diverse academic community, we are contributing to western Pennsylvania in a way that will help to secure its transformation and success. The Pittsburgh media has reported often about the region’s lack of diversity and how it diminishes the chances for organizations and corporations looking to relocate. Likewise, the Pittsburgh metropolitan region continues to have one of the oldest populations in the country. Despite what we all know and love about southwest Pennsylvania’s blend of rural beauty and city sophistication, we face being left behind in favor of other cities that have access to qualified, forward-thinking, young workers. Corporate leaders understand that having a diverse staff is good for business—for understanding a changing customer base, for bringing a variety of perspectives to the table. Regions with a well-educated and diverse citizenry grow. As we continue to educate the children of Pennsylvania, we have found it most important to reach farther into minority populations here and across state lines. Well more than 20 percent of our student body consists of underrepresented groups, while we host more than half of the State System of Higher Education’s international population. To bring together students of all backgrounds sets the stage for eye-opening educational experiences and prepares them for what they’ll face after they graduate. A diverse and inclusive environment is a pathway to better business, better communities, and general prosperity. No doubt, IUP is a part of the solution to making our region vibrant through diversity. We are in the midst of planning our new science building. Interest and charitable investment are building for our science and math programs, including two recent million-dollar gifts from Bill and Audrey Madia and Terry Serafini. If you love March Madness, you’ll want to stay tuned to our basketball teams, both of which have had top rankings in the NCAA Atlantic Region. Our women’s basketball team is hosting the semifinal game in the PSAC tournament this weekend. This entry was tagged Center for Multicultural Student Leadership and Engagement, Diversity, economic development, Elkin Hall, inclusion, international students, Pittsburgh, prosperity, underrepresented groups, western Pennsylvania. Bookmark the permalink. Mike, leadership update. My pride in my IUP degree continues to grow seeing the results of your leadership. It’s always good to hear from you, Don. I’m thankful for your kind words.